I am remembering my first years travelling initially in Portugal back in 2005 and 2006. I didn’t want to spend too much money, I also wanted to eat what the typical Portuguese ate for lunch, I knew that I could eat in the fancier spots, but I headed into the neighbourhoods where the ‘real’ people lived and tried their typical ‘menu de día‘. It was interesting at times and really not very good for the most part. It was difficult to get away from the meat or fish as the dominating item on the plate with barely a garnish of vegetables. I hungered for something different. In a small city north of Lisbon, I found on a narrow lane off the main square a unique restaurant, vegetarian-fusion cuisine. I started to wait outside the door for it to open, to be the first customer and each time I said to the servers that my body was thanking them for all these wonderfully prepared vegetarian food. They looked at me strangely. No surprise! I did learn to eat well in Portugal and have learned to do the same here in Spain. It does take time. I have spent the last three days in the Basque country. They eat well here. I lunched the other day in Vitoria-Gasteiz, an ancient Basque city, one of the many Spanish cities which we have never heard of but are worth a visit. I am in a chic little modern cafe that is part of a new museum complex. 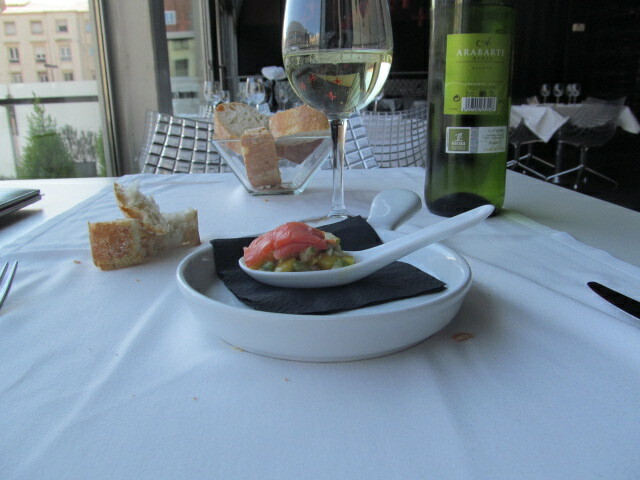 ‘Menu de dia’ for 16.50 euros, a little more than $20. Three courses including the bottle of wine. My server brought me what the Quebecois would call a ‘amuse-guele’, a spoonful to tantalize the palate; in this case, some smoked salmon on some mixed vegetables. 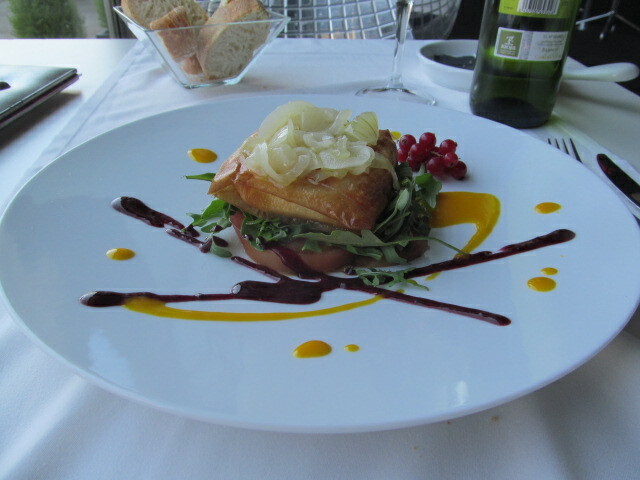 The first course (I had four or five choices) was goat cheese prepared in a very light phyllo pastry on a bed of arugula and tomates, with caramelized onions on top. I could easily have eaten a second one of these. More, sir! 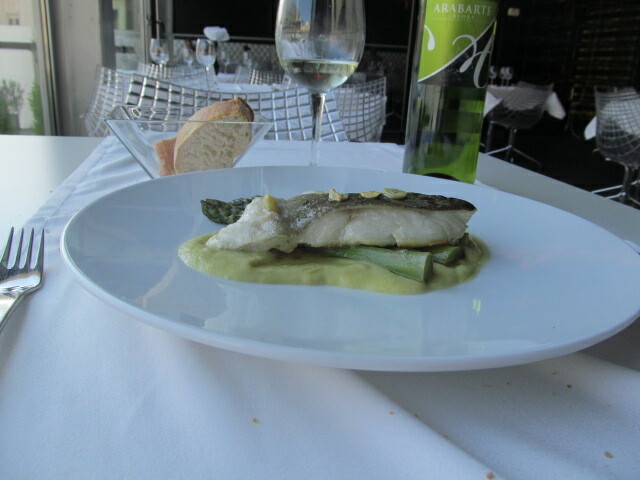 The second course (again from choices, the rest of which were meat) was cod beautifully cooked on a bed of asparagus in a creamy leek sauce. This is not your typical central Spanish cuisine, which clearly comes directly from grandmother’s kitchen. There are other influences at work here, particularly from the Mediterranian, France, Italy, at times, North Africa. I usually do not choose a dessert; my standard line is that I don’t like desserts (this coming from the pie maker?) but more so because I do not want to change the memory of a meal by putting cheese cake or some equivalent on top of the savoury courses. I am changing my mind and taking advantage of the all inclusive price. 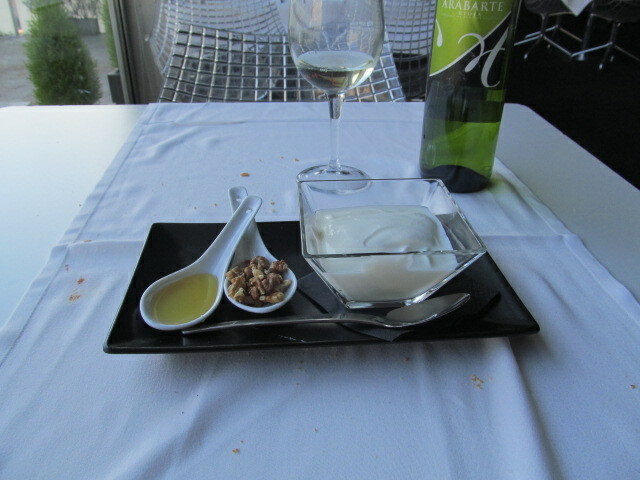 A very thick yogurt with walnuts and honey. I have had variations of this now in different parts of northern Spain, and especially one variation with a very young cheese, like the next step from yogurt. It can be called cuajada del abuelo (of the grandfather). I ask for it now. 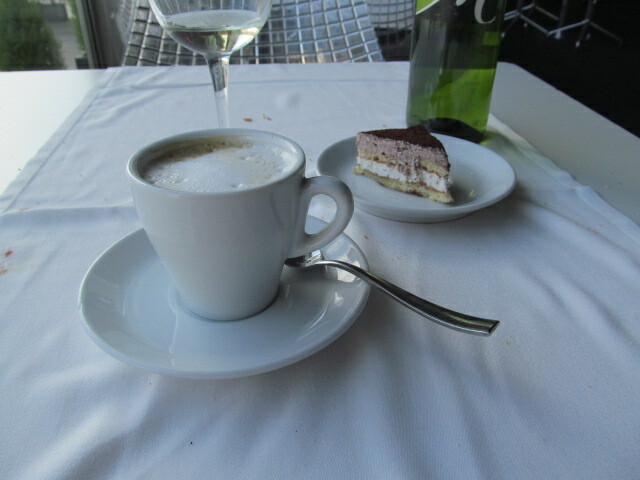 As if to make sure that I was breaking my resolve about desserts, my young server brought me some cake to go with my café con leche. I would like to add just a few more photos. 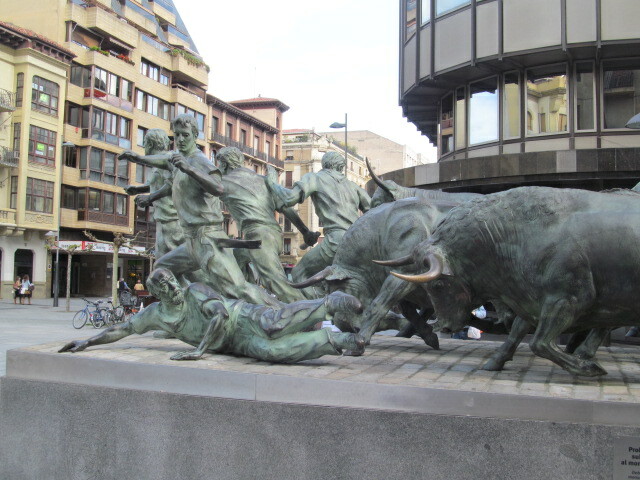 The following day I was in Pamplona, the town famous for its festival in July, the running of the bulls and the young idiots who run before them through the narrow streets hoping not to be gored. This sculpture which ‘celebrates’ the event is located on Avenida de Roncesvalles , a broad avenue of expensive shops and banks with little sense of neighbourhood. The original Roncesvalles is 40 some kilometres north of Pamplona. I live in the actual neighbourhood of Roncesvalles. 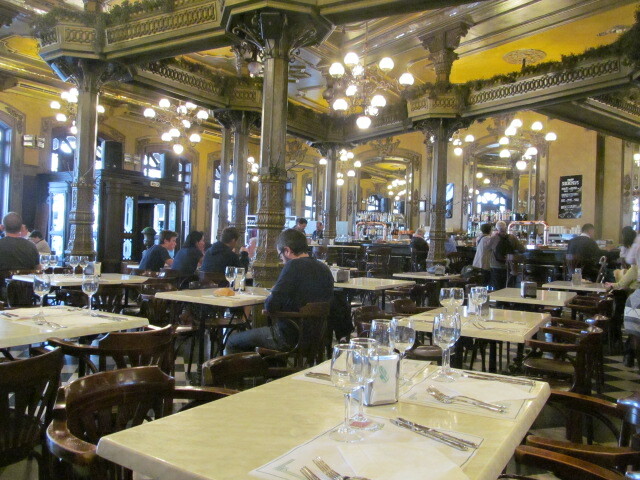 I had lunch at the famous Café de Iruña, situated on Pamplona;s main plaza. Some interior, eh? Apparently it was Hemingway’s favourite haunt in Pamplona. 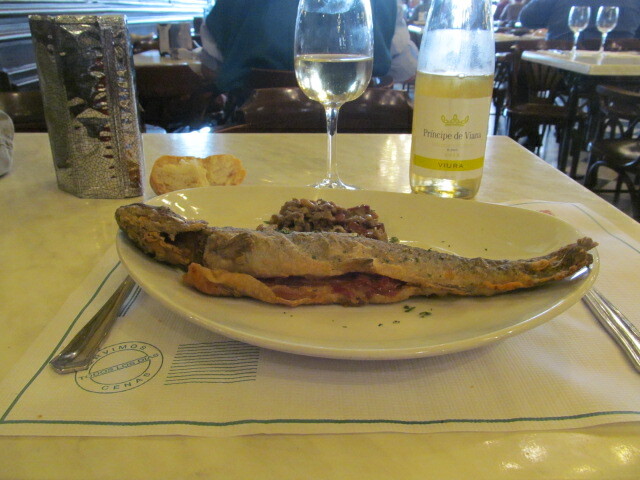 The main course, farmed trout from a region with countless trout streams! Beautifully grilled, of course with the head still on, and, we are in Spain, stuffed with slices of, you guessed it, jámon – and the mushroom sauté is also laced with chunks of the ubiquitous jámon. Notice once again, and we are in Spain, the bottle of wine which came as part of the meal ($17 Canadian) Knowing that I was going to be spending a few more hours in this city, I did drink quite a bit of this one. I have never had a bad wine in this country. 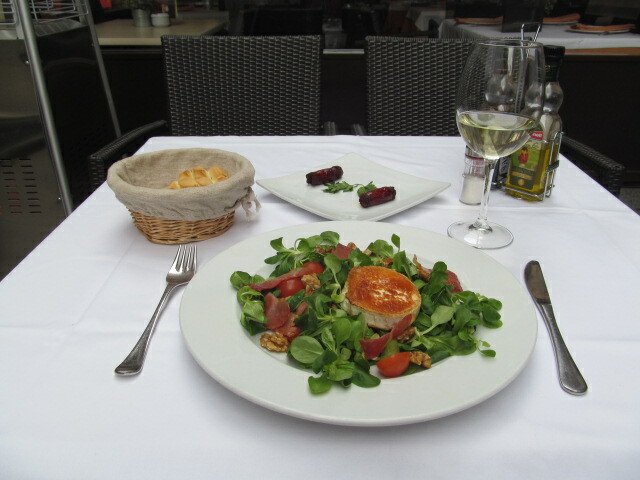 Earlier today in another small, unknown-to-us city, Palencia, I enjoyed a salad similar to the one above with the deep-fried goat cheese, this time with watercress, tiny tomatoes and walnuts, and now, guess the other obligatory ingredient! Yes, did you find them, the six slices of a kind of local bacon? The plate at the top of the photo? – this restaurant’s take on amuse-guele, two tiny morcillas, black sausages. They failed to amuse today. Knowing that I still had some distance to drive, I asked only for a glass of wine. Time to stop writing, time to head out to see my next city, Valladolid, has to offer me. Something lighter hopefully and a humdinger of a futbol game! A late night report! Valladolid is full of small tapas bars and the spreads are amazing. I am here for four nights and the belly is growing! This entry was posted in Uncategorized on April 24, 2015 by agnotarte.